Try a smart physics puzzle action. 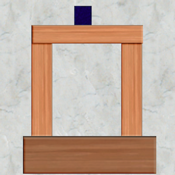 In Wood Destroyer, your goal is to keep the blue cube on the gray blocks. Tap to destroy the red blocks. While at it, the other blocks may fall or tip over based on real physics action. Good timing and smart thinking will help you to complete your goal.